Something is happening and ski resorts may be the best answer. for the last decade I’ve been covering the intersection of social media and ski resort marketing. First was the meteoric rise where resort follower and fan counts grew by double digits in single months. But since then things like fake news and scandals and data breaches and elections have cooled off expectations and, more importantly, growth. 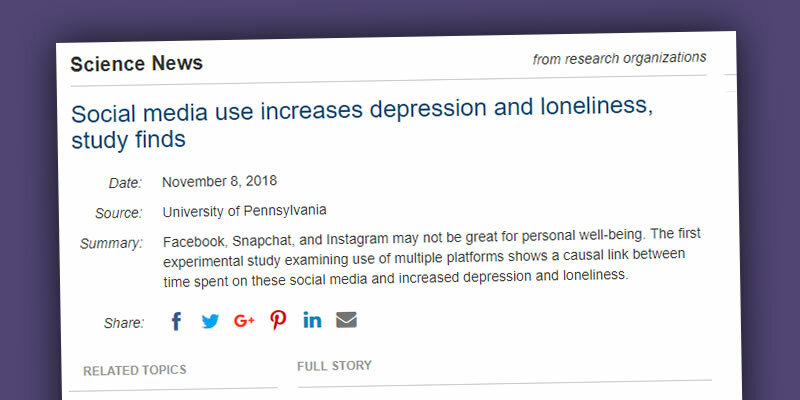 New data linking social media use to depression, suicide, and bullying haven’t helped either. When monthly active users in a region as large as Europe dip across a quarter, it could be a fluke. But when it happens two months in a row? You can’t help but take notice. Let me shift now from big data to three anecdotal observations that occurred in the space of a couple weeks during October. Nick is the president of PSIA and during a conversation in Denver recently, he told me that he recently quit social media cold turkey. His only regret? That he didn’t do it sooner. A local religious leader here in Utah challenged teenagers to take a week off of social media. They did and, again, were blown away but how “liberating” it was (their word, not mine). At our local junior high ditching social for a week became a “thing” that everyone started doing. My wife, inspired by the kids, followed suit. She took a week off of social during a trip to visit her sister and…well…never went back. Two months later, she doesn’t miss it in the least. Do a search for “quitting social media” on any outlet (including social) and you’ll find hundreds of thousands of people discussing and contemplating taking this exact same step. Every movement requires a tipping point before gaining real momentum, and man, it feels like we’re getting close to one here. But even if that mass exodus doesn’t come, the fact so many people are considering it creates an opportunity. This idea is half-baked, so I’m not sure exactly what this might look like. Maybe it’s a just sprinkled throughout social posts with more references to “unplugging” or maybe it’s something more obvious like a lodging package that includes a phone locker that keeps your device safe but out of sight during the day. Whatever the angle, I can’t help but think that something is happening and I can’t help but think that a beautiful mountain with endless outdoor activities could be the answer.